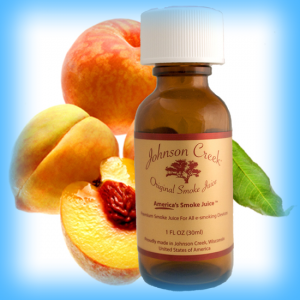 This review is on the e-liquid, or as the developer Johnson Creek calls them Smoke Juice, Summer Peach. I purchased the 15 ml bottle of the 18mg nicotine strength variety. The traditional Johnson Creek e-liquid is a part of the original mix that is composed of Propylene Glycol and Vegetable Glycerin. Johnson Creek offers a variety of flavors and a top notch website. Great presentation and the speedy shipping was also a bonus. You have a large variety of shipping options, from USPS to UPS. Even overnight, if you just have to have your fix. Great job. Now I, in my cigarette days, was a menthol smoker. I enjoyed the taste of menthol and didn’t really see myself enjoying anything else. I read lots of reviews on each flavor John Creek offers, and this is one that has a lot of positive feedback. I am one who is ever up to exploring, so I took the plunge into the odd world of fruity e-liquid flavors. And, I must say, I am ever so happy I did! The quality of the e-liquid is top notch. Great throat hit, large amounts of vapor and that taste was not a distraction. It’s a very tangible element in the draw and really makes the experience enjoyable. I can say for me, the peach, did indeed taste like peach. For me, the peach tasted like it was part of a cool peach margarita. Now, as I mentioned before, taste is very personal, and others may not like the taste at all. So, that portion I will leave for each of you to decide for yourselves. But, I can feel the care, meticulousness and strive for excellence Johnson Creek puts in its products, from presentation to finished product. Summer Peach is now my favorite e-liquid flavor. Thank you very much, I always appreciate when someone takes time out of their busy day to post a little reply. So thank you, once again, for your time.